Omega’s rugged OMPBD7 pilot devices offer maximum flexibility and a wide choice for all applications. This 22 mm line is aesthetically appealing and modularly designed to make assembly and interchangeability easy. The OMPBD7 Push Button operators are available in two different body styles to meet every application need. Both operators exhibit a new lower profile stylish appearance while maintaining the rugged performance necessary for demanding environments. How does Momentary vs Maintained apply to Selector Switches? 2-Way and 3-Way selector switches come in multiple configurations, fixed positions or spring right return, spring left return or both. When you select a position and the switch remains in that position then the switch is considered maintained in all positions. With a spring right return or spring left return selector switch, the return position would be a maintained condition where the spring position would be a momentary position and the change in the contacts would only apply while the knob is held in position. Front elements, including push buttons, mushroom operators and selector switches, are IP 66 protection against submersion, oil and dirt, making them reliable in the toughest industrial environments. OMPBD7P is a plastic operator with a captive black plastic front bezel. Constructed of high-grade thermoplastics the OMPBD7P is the corrosion resistant solution for harsh environments and is rated NEMA Type 4/4X/13 &AMP; IP65/66 for use in wash down locations. For super tough applications, the OMPBD7M has a die-cast zinc housing and mounting ring for rugged durability. Both are finished with corrosion resistant chrome plating. The OMPBD7M also features a captive shiny metal bezel for a polished appearance. Metal operators are NEMA Type 4/13 &AMP; IP65/66 rated. Include push button operator, plastic tool-less latch and one contact block. Green 'START' cap for flush momentary pushbutton. Green 'I' cap for flush momentary pushbutton. Red 'STOP' cap for flush momentary pushbutton. Red 'O' cap for flush momentary pushbutton. 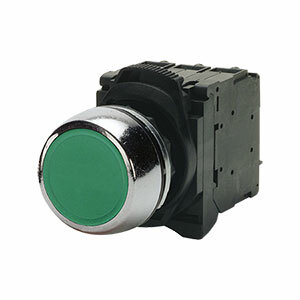 참고: Pushbuttons come with operator, color cap, mounting latch and 1 contact block.